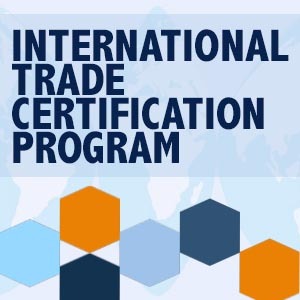 BACKGROUND: The International Trade Certification Program (ITCP) was developed by the WTC-KY to provide the foundation for effective and efficient management of a company's international trade operations by providing information that is both current and relevant. CURRICULUM: The Certification curriculum is designed specifically for the trade practitioner. Our three-day program is taught by business experts, all clients of the WTC-KY, in areas ranging from banking, tax, legal, customs compliance, market intelligence, freight forwarding, international marketing and customs brokerage. The International Trade Certification Program is a recognized "knowledge share" where class participants learn from peers and in turn, can effectively grow their organization through international trade. RESULTS: The ITCP has an alumni network of over 300 graduates representing 150+ companies and organizations to date. These alumni earn his/her certificate of International Commerce Specialist after three rigorous days of class time and individual testing. The International Commerce Specialist certificate is accredited by the National Customs Brokers and Freight Forwarder's Association of America (NCBFAA). Please note that there are no refunds within seven days of the event. We look forward to seeing you at the event!